like a vampire its lover. of course, has already happened somewhere before). a long drawn out initiation? straight out of my soul they dragged it, the thieves. now you have nothing to drink, I’m sorry. in the autumn even vampires drink beer. I would have given everything to you, to the last drop. without any stakes, with weakness broken on the knee. only one sip remains there. Anastasia Eduardovna Baburova was born on 30 November 1983 in Sevastopol. She studied at the Moscow State Institute for International Relations and then at the Department of Journalism of Moscow State University. She worked for the newspapers Vecherniaia Moskva, Izvestiia, and Rossiiskaia gazeta. She wrote poetry which she published on her Livejournal page. 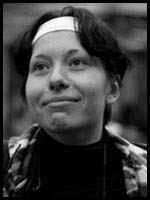 She took part in anarchist and ant-fascist movements; in public protests against police lawlessness and against rising prices for public transportation; she was a member of ecological protest groups and participated in forums on social issues. She worked for the journal Avtonom. In June 2008, she took part in protests against the unlawful eviction by prison officers of refugees and former workers from hostels, and was detained. It was while she was taking part in these protests, writing about them, and defending the activists in her role as a journalist, that she met Stanislav Markelov. From the autumn of 2008 she began working as a part-time reporter for Novaia gazeta, writing about the trials of neo-Nazis. On 5 January 2009 she interviewed Stanislav Markelov, the last interview he gave to Novaia gazeta before his death. She accompanied him as he left his last press conference. On 19 January 2009 at around 3 pm near No. 1, Prechistenka Street, as Stanislav Markelov was killed by a shot in the back of the head, she threw herself on the attacker and was mortally wounded by a gunshot to the head. She died later that day in hospital. She is buried in Sevastopol.